We’ve saved the most popular of our previews for last. On average, we receive 50-60 albums each week, up to half of them ambient. This is great news for fans ~ you’ll never run out! On the flip side, it’s tough on artists and labels seeking coverage. The irony is that reviewers tend to cover releases that stand out in a field that prides itself on fading into the background. This is a good time to remind our readers to check out our News page for streams of upcoming releases and our Links page for sister sites, because for every album reviewed here there are a dozen that are not, and we want you to find them! This being said, we love our seasonal previews, because they provide a jump start to the musical season. Our cover image is taken from the children’s book The Good Egg by Jory John (who also wrote The Bad Seed). These HarperKids books make great companion pieces. Check out the fun trailer here. We’ve been waiting five years for a new full-length album from Kyle Bobby Dunn, and now we’ll be getting a 4-LP box set! Some of the limited edition variants have already sold out, so we know people are getting excited. Dunn has left nothing to chance; Loscil and Simon Scott are but two of the many collaborators, and the music is pure melancholy, distilled to its essence. Tim Hecker‘s Anoyo is a companion album to last year’s impressive gagaku-based Konoyo. This version is stripped bare so that one can see the seams: another way to appreciate the intricacy of the recording. Some may even prefer this one to the original; but when music is this alive, can it ever be at rest (Kranky, May 10)? PAN has announced a new soundtrack series, launching April 26 with Tujiko Noriko‘s Kuro. The film debuted on the festival circuit in 2017, but the release of this evocative and occasionally unnerving score should give it a boost. Check out the trailer here. Zombi’s Steve Moore switches gears on Beloved Exile, enlisting the aid of harpist Mary Lattimore, percussionist Jeff Gretz and Tunisian vocalist Emel Mathlouthi. The end result sounds a lot like Dead Can Dance, and should have crossover appeal (Temporary Residence, May 10). Christopher Whitley‘s Solos is slow and beautiful, a collection of gently decaying violin loops. The album is the latest to receive the personal treatment on Fluid Audio; the physical package includes a glass slide, maps and two mini-CDs (March 28). Be sure to get on their mailing list, as the label will follow this release with Bill Seaman‘s gorgeous Topologies of Blue, a nostalgic set that combines sampled loops and live instrumentation (March 31) and The Seaman and the Tattered Sail‘s Standing on the Precipice of Tears in June (featuring Seaman and Craig Tattersall); later the same month, Fluid is scheduled to release Tobias Hellkvist‘s Annoying Tyrannies. Handstitched* is another DIY label that specializes in small-run, handmade releases, their latest a split venture with False Industries. Azurescens is the new project from Maps and Diagrams, and is out April 19 in an edition of 80. There’s a beautiful double rainbow on the cover of Ex-Confusion‘s I Remember When, and the music is as soothing as a spring afternoon. Benoit Pioulard guest stars on “I Owe the Earth a Body” (n5MD, March 22). Following this, n5MD will turn its attention to Proem (covered earlier in our Electronic preview) and Okada, whose Life is but an Empty Dream is set for release on May 24. The artist continues to offer a blend of ambient, electronic and modern composition, but the track titles lead us to believe that he’s made beauty out of breakup. If so, we recommend that he listen to Alex Bober‘s calming guitar-based album Invisible Forest, which is specifically aimed at those “overcoming loss and seeking solace” (Hidden Vibes, March 25). Some may have missed the news that Hammock has been releasing long tracks once a month as part of the project Undercurrents. Three tracks are already up, totaling 70 minutes, and we can expect nine more to appear before the end of the year. Home Normal’s Ian Hawgood returns with Impermanence on Slowcraft Records, preceded by the single Fire (April 18). A mind is literally blown on the cover of Tropic of Coldness‘ Maps of Reason, but don’t be dismayed, as it’s only a metaphor (Krysalisound, March 31). Russ Young‘s Pala EP was made in the morning, but imagines the night. 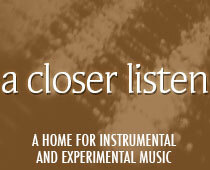 The tracks shift like the gently changing skies of a slow motion dream (Audiobulb, March 20). Zen is mentioned twice in the press release for the third outing from Arovane & Porya Hatami; expect C.H.R.O.N.O.S. to exude a peaceful vibe akin to that found on their last two releases (Karlrecords, April 26). Audio Obscura spent the last few years Gathering Silence, recording the sounds of numerous Norfolk churches and cemeteries. By adding gentle music to these field recordings, he’s created an experience that can be described as holy in its own unique manner (March 21). Osa7029‘s Orchestral contains a classical influence, and a soprano can sometimes be heard singing through the clouds (March 21). Or Sobre Blau‘s The Piri Piri Samplers places guitar atop guitar via pedals, with a result bordering on shoegaze (Memorials of Distraction, March 22). And M Sage incorporates violin, saxophone and bamboo flute on Catch a Blessing, which includes a cheerfully geometric video (Geographic North, April 5). Have you ever looked at all of Dauw’s releases at once? This is how to do a unified cover aesthetic. The label’s next release comes from Stijn Hüwels, who samples Sylvain Chauveau, Steinbruchel, Tomoyoshi Date and more on Tomodachi (March 22). Music production team PureMagnetik has just launched a label, and the first two releases will appear on March 21. Larum‘s Into a Bright Land is a slowly-unfurling, GAS-like suite, while BlankFor.ms‘ Works for Tape and Piano is a reflection of its title, tailor made for cassette culture. Aros E-V‘s loop-based return journey is inspired by the tokens the artist took on a trip (including a garage sale choir tape) and the memories he brought home (April 1). Yannick Franck Presents Mount Gemini offers “a deconstruction of Ska, Rocksteady and Skinhead Reggae from the 50s, 60s and 70s” on Just Like a River. The loop and delay-based work verges on hauntology (Sub Rosa, April 2). Fans of small sounds will enjoy the micro textures of Tomotsugu Nakamura. The artist combines organic and electronic elements to create a ladybug-like world. monologue is out April 24 on Audiobulb. Lost Sunsets is an ambient/electronic hybrid from Massimo Amato, seeing the light on the cusp of summer; look for it May 24 on Pregnant Void. 36 is unveiling two releases on April 2. The first is the limited transparent vinyl edition of last year’s Ego Death, while the second is C45 Dreamloops 1-2, the first installment of an ongoing series. Sonmi451 shares some Nachtmuziek on April 16, perfect for spacemen sleeping in wool, as seen to the right (Astral Industries). The music of Anna Homler has been discovered by a new generation, and Deliquium in C pairs the artist formerly known as Breadwoman with one original collaborator and three new ones. The first public track includes the sound of snoring. (Präsens Editionen, April 12). Any music from naps is going to be restive; better to give is also positive, and is out mid-April. Michael Stegner‘s Music for Sleeping in the 21st Century is designed as a sleep aid, and can be tested at home on March 21. Sean Addicott also tackles the restless hours on Tapesleep, a 90-minute exploration of insomnia whose movements travel through the nighttime stages. The first single is Restless Bursts (April 19). Dreams and darkness are the themes of When the Light Went Out from Fallen. The artist reads Dickens, quotes Poe, and creates a blanket of sound (rohs!, March 20). After hanging out with David Toop, Alexandra Spence recorded Waking, She Heard the Fluttering, a set that hides riches in whispers (Room40, April 5). One of the most fascinating releases of the season is a collaboration between musician Roméo Poirier and poet Lars Haga Raavand. Kystwerk is a water-drenched exploration of life and love, replete with horns, electronics and a sense of oceanic drift. The vinyl edition is offered with a zine that includes translations of Raavand’s world-weary words. Especially recommended to Kleefstra fans (Kit Records, March 20). The ocean theme continues on The Sea To Which The Body Is Drawn, from Wreaths. The entire set is water-based, and eventually ends up on the shore as bowed mandolin seeks to replicate the cycle of the tides (Panurus Productions, March 22). Listening to the waves of “White Heron,” one begins to think of spring, despite the fact that Naomi is the first release on ACR offshoot Warm Winters Ltd. The project includes poetry from FARWARMTH and music from FARWARMTH and Rui P. Andrade under the HRNS moniker (March 22). MixCult Records‘ ambient radio channel Spitzer is now an ambient label. Compilation Phases of Matter is the first release, and continues ambient/electronic tracks from SineRider and Warmth (March 25). Floating Points is the latest artist to mix an edition of Late Night Tales. The set begins with an exclusive track from Sarah Davachi, and includes music from Kara-Lis Coverdale and Kaitlyn Aurelia Smith (March 29). RVNG’s FRKWYS Series continues with #15, combining the intergenerational talents of Visible Cloaks + Yoshio Ojima and Satsuki Shibano. serenitatum is released April 5 and has a distinctly Japanese flavor, with every chime and sung note landing exactly where it belongs. Olivia Belli has remixed her own piano set, adding a more ambient/electronic flavor; Where Night Never Comes (Remixes) is out April 26. Permafrost is the inspiration for Equal Stones‘ Below Zero, no surprise as the album is released on Glacial Movements. We love winter music all year long, and this album reminds us that some places never melt (March 30). The apocalyptic John 3:16 returns with 200 Million Horsemen, which seems like a lot of riders considering the fact that Revelation includes only four. The album is released April 16 (Holy Week) on Alrealon Musique. With titles including “Last Day On Earth” and “Death Is Not a Lover,” it would be easy to hear the new Mondkopf LP as a score to the end times. How Deep Is Our Love? implies otherwise, recalling the Bee Gees. The music will in fact be the score to a film based on the play “The Silence of the Sirens,” and is out April 19 on Hands in the Dark. Lullabies might sound like a fragile, crib-friendly album, but it’s actually an excursion into dark realms, as evidenced by the claustrophobic “Annihilation.” VVWVLS‘ shadowy journey begins on March 20. The thick synths of Louis Sterling produce a pleasing haze, though the track title “A Reminiscence of 2000” makes us feel old. Adisceda is out April 12 on 99Chants. And as we mentioned when we started to review the series, Angry Ambient Artists turn into dark ambient and drone artists. Vol. 4 presents a new side of Cornflux Cordwell and Tomonari Nozaki (Forwind, March 28). Deaf Center returns after a long absence with Low Distance, led by the classically-tinged Movement/The Ascent. The album invites listeners into a world in which nothing is as it seems (Sonic Pieces, March 22). On the same day, Deaf Center’s Erik K. Skodvin (as Svarte Greiner) unveils Twin, a dense 40-minute reinterpretation of DC’s Owl Splinters, originally available as a bonus CD (Miasmah, March 22). Five years have passed since the last Fennesz album, so fans should be overjoyed with Agora. The trademark drones are intact, as well as a bit of soft abrasion (Touch, March 29). Forest Management‘s Passageways is a tribute to his childhood home in Cleveland, and it comes with a plan. If the home is ever sold, the artist plans to hide a copy of the album in the house for prospective buyers to stumble across. For now, buyers can invest in both an album and a t-shirt (Whited Sepulchre, March 22). The international border crisis continues to rage, and so do those dismayed by xenophobia. Chris Weeks‘ Borders attempts to provide a score to the current political climate (Odd John, March 29, pictured right). Haarvöl and Xoán-Xil López team up to present a hyper-literate suite for a dance performance. Unwritten Rules for a Ceaseless Journey references revolution, environmental degradation, and images of utopia as found in the writings of Adorno, Block, Foster, Agamben and more. Come for the ideas, stay for the music (Cronica, April 9). Kinbrae alternates between melodic ambient and soft drone on Landforms, but extends its range on lead single The River Awakens, folding in a touch of post-rock (Truant Recordings, April 5). Organ drone and synth combine on the new album from ASUNA & Jan Jelinek. Signals Bulletin operates as a wonderful meditative aid and is out April 5 on Fatiche (pictured left). Zachary Paul offers two longform violin pieces on A Meditation on Discord. Effects pedals sustain the notes, creating a trance-like atmosphere that must have sounded perfect at last year’s Desert Daze Festival (Touch, April 12). Sublamp‘s Sister Maps takes six sonic snapshots of imaginary cities, each 12 minutes long. The artist visited nineteen actual cities while recording the album, while listeners travel around the world in an hour (Dragon’s Eye Recordings, March 29). Here’s an album title you’ll probably never remember: Glottal Wolpertinger (Fiepblatter Catalogue #6). Fortunately Jan St. Werner (Mouse On Mars) is a household name. Each installment has been different, so we’re eager to hear what the artist has in store (Thrill Jockey, May 3). Tomo Akikawabaya adopts a new moniker and invites a guest along for the ride on KiTsuNe / Brian The Fox as The Future Eve featuring Robert Wyatt. Voice and drone intertwine, each complimenting the other (flau, March 22). flau then fills their April release slate with je suis by nous (Henning Schmiedt and Marie Séférian) April 3, and Sagrada Reset by Rayons on April 10. Both are vocal-centered, electronic-based releases. Black metal influences decorate Eternal Binding, a 3-track offering from Only Now. A choir visits, along with some dark drums; this is music for the middle of the night (March 22). Similarly tortured is Victor Espasandín‘s Árbol Bajo Tormenta, which takes a dangerous trip to the sonic underworld by way of Uruguay. Look for it on the reliable Anyimes label on March 26. While we await the final season of Game of Thrones, we can enjoy the cinematic compilation Forest of Thorns, whose tracks range from dark ambient to ritualistic drone to industrial (Dornwald, March 25).